An occurrence that would happen every other night if BL was planning the menu. His dream dinner rotation would go something like this: Pizza, Stir-Fry, repeat. Smoothies for breakfast and Taco Salad for lunch. I’ve never met a man who could eat the same thing every.single.day and not get tired of it. Well, lucky or unlucky for him, he met me. A gal who needs a lot more variety in her diet. Don’t get me wrong, we still do pizza night though we’ve cut it down to bi-weekly. A little to do with variety and a lot to do with portion control. What is it about cheesy, dreamy pizza where I lose all self-control? BL and I easily split a large pizza for dinner. That’s crazy. Over the last several years, we have both done a pretty good job of reducing the amount of dairy in our diet. No small feat for a Midwestern boy. Milk? We’re complete converts to almond, soy, coconut and oat. Butter? I can’t remember the last time I bought a stick of butter–not with Earth Balance on the shelves and my love for good quality olive oil. But cheese? Well, that’s another story. Especially when it comes to the aforementioned pizza night. I’ve tried a lot of dairy-free pizzas. A lot. Like 72. And most of them are good but always lacking that something. That creamy, umami, savoriness that cheese is. Since I don’t shy don’t from competition lightly, I was on to create version #73. 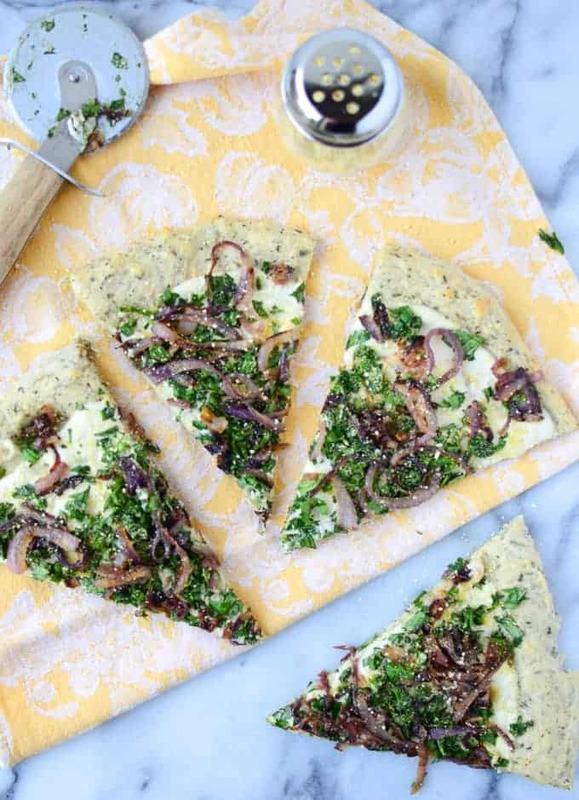 This vegan white pizza is pizza without being a pizza. Garlic-herb crust baked until golden brown. 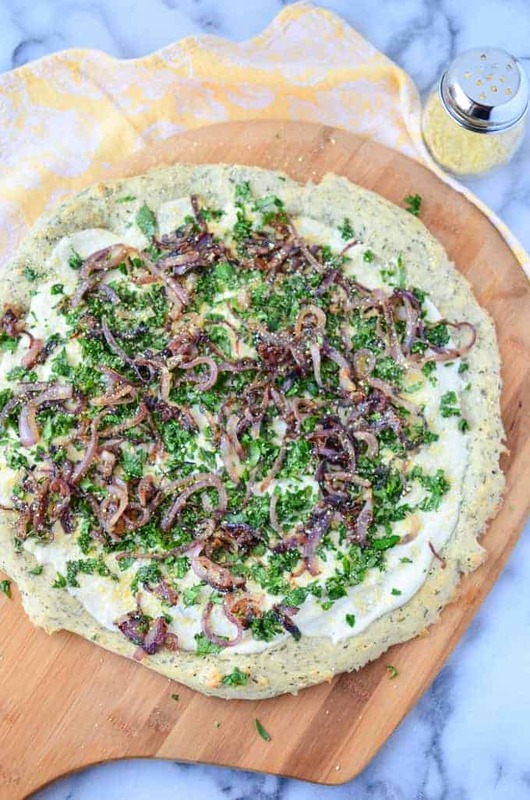 Then topped with a creamy garlic white sauce, caramelized onions, herbs galore and veggie-parmesan shake. And yes, all that garlic makes it the perfect date night pizza. Just, um, make sure you are both eating it. The base of this recipe is one of my favorite things in the world- The Garlic & Herb pizza crust from Trader Joe’s. If you do not live near a TJ’s, I’m sorry. For many reasons I’m sorry, but mostly because you don’t know the herby goodness that is this pizza dough. Besides being less than $2, it’s the perfect pre-made dough that provides a flavorful canvas for just about any toppings you can get your hands on. 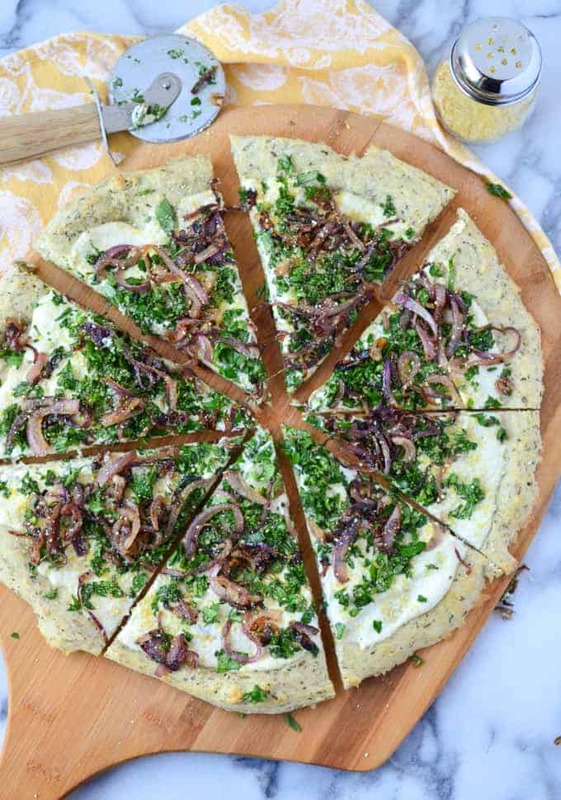 If you can’t find the herb crust, you may make your own or use a plain dough. However, using regular crust won’t have the same layering of garlic and herbs so you might need to add a bit more for toppings. For the creamy garlic sauce, we turn to my favorite dairy-free friend: the cashew. Can I invest in cashew stock? If so,well, you might too considering how many packages of these nuts I go through in a month. Soak the cashews, drain, and blend with a little bit of nutritional yeast & garlic. This is one of those recipes where you really need nutritional yeast. 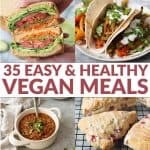 If you aren’t dairy-free, you could substitute with parmesan cheese but I think it’s worth seeking out nutritional yeast. If your regular store doesn’t carry it, consider ordering it online. Nutritional Yeast= Amazing nutty, cheesy flavor. We sprinkle it on just about everything: pizza, popcorn, pasta, you name it. Plus, it’s the secret ingredient in the veggie-parmesan shake that we will use to top the pizza. If you get the fortified version, you get a little micronutrient bump as well. Since you are cooking the pizza dough first without the toppings, make sure to stretch it pretty thin. You don’t want it to be overly doughy. More crispy than chewy. For herbs, add what your family likes best. I did a combination of basil (essential), parsley and fresh oregano. 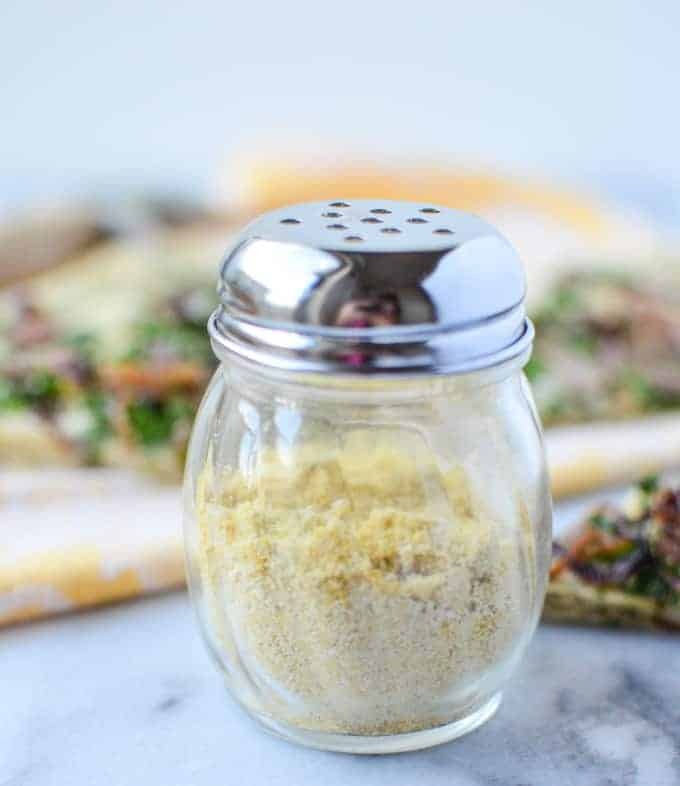 The secret ingredient to making this taste like pizza and not garlic-herb flat bread is the vegan-parmesan-shaky-shake (official title) that we will sprinkle on generously after all the toppings have been laid down. Again, cashews and nutritional yeast (is there anything those two can’t do?) combine to create a dreamy-nutty-salty topping that elevates the entire pizza to gourmet, you are a genius status. Put it in a shaker-jar and shake-shake away. If you’re looking for the perfect pizza night consider making these healthy peanut butter banana ice cream sandwiches to enjoy for dessert! Garlic lovers unite! 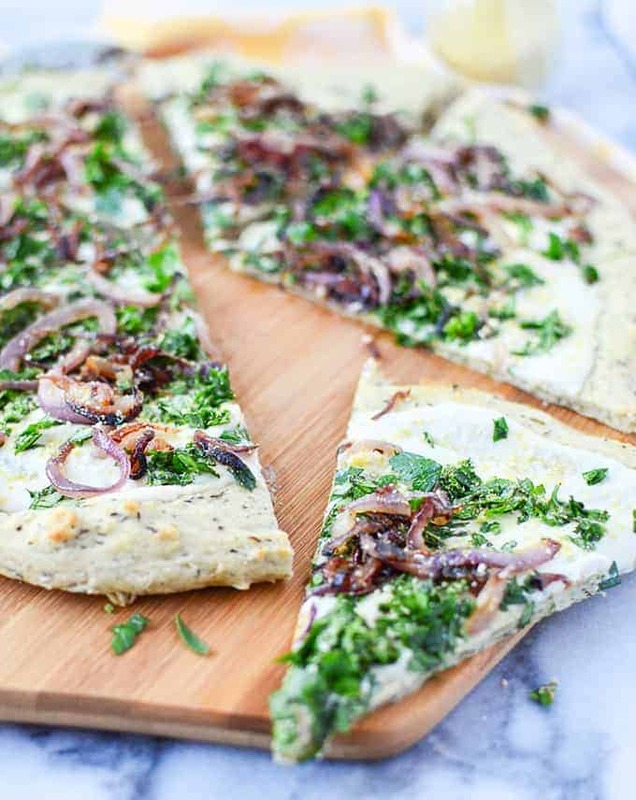 Creamy dairy-free garlic sauce with caramelized onions and lots of fresh herbs! Vegan pizza at it’s best. Remove the dough from the package and let rest, about 20 minutes while you prepare the rest of the ingredients. Heat a non-stick skillet to medium-high heat and add 1 tsp. oil. Add the onions, reduce heat to medium-low and cook, stirring often until onions have caramelized. In a high-powered blender, place in the drained cashews, nutritional yeast, salt, garlic, cornstarch milk and lemon juice. Blend, on high until smooth and creamy, about 4-5 minutes. The sauce should be very smooth, not grainy. Lightly flour your hands and stretch the dough out onto a pizza stone or peel. Brush the crust with the remaining 1 tsp. of olive oil and place in the oven for 10-12 minutes until golden brown. (If you are using another brand of pizza dough, make sure to cook according to package directions). Remove the dough from the oven and let cool slightly. Add the garlic-cashew cream in a single layer. Top with caramelized onions, fresh chop herbs, red pepper flakes and Parmesan cheese. I always buy that Trader Joes pizza crust, such a blank canvas ready to be painted, love what you did here… I’m a huge cheese lover but my recent tries of cashew cheese definitely make for a great dairy free combo. I’ve never made the vegan parm cheese, so clever, definitely sharing with my lactose intolerant friends! 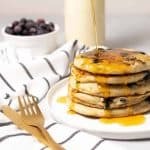 thel link for the cheesedoens’t work.. ( minimalist baker) can you post recipe? Basically, it’s 3/4 cup cashews, 1/4 cup nutritional yeast and a little garlic salt. I cut the serving size in 1/2 and it worked out perfectly! Just make sure you don’t over process- you don’t want parm. butter! never would have thought of using cashews to create this sauce-creative! Our boys must have similar tastebuds…because pizza every night would be music to his ears! And with this pizza…it would be music to my belly. YUM. I’m so with you on the cheese! When people ask me if I’m a vegetarian/vegan I always tell them I’m a cheese eating vegan! Ha! Ha! I love it! Thanks for commenting! Ohhhh splitting a pizza for dinner doesn’t sound so crazy to me 😉 This looks fantastic! Is there anything cashews can’t do? They are a magical ingredient in the kitchen. I love the bright colours on this masterpiece! Thanks Allison! And no- Cashews are my secret weapon in everything! My husband is a midwestern boy too, and he’s vegan! He definitely didn’t grow up that way. His family pours tall glasses of milk for EVERY dinner. He loves pizza and we use Daiya cheese on our homemade pizza. I have made a cashew cheese sauce before and I actually prefer it, but he likes the Daiya! This looks like my type of pizza. I wish we had a Trader Joes in Alaska! Thanks for sharing such a delicious pizza recipe! Cannot wait to give this a try! Sounds delicious. I will be making an herb crust from scratch but it shouldn’t be an issue since I’ve made them before. Would love to give TJ’s crust a try but don’t have them here in Alberta. By the way, I’m planting my zucchini this year with your recipe, VEGAN ZUCCHINI GRATIN, in mind. Why the corn starch if the sauce is not heated to thicken it? Could it be skipped?